Engine is a San Francisco-based nonprofit that claims to be the “voice of startups in government.” The group, which also has a lobbying arm called Engine Advocacy, told reporters at its launch in 2011 that it would advocate for startups as a counterweight to lobbying by corporate heavyweights like Google, Verizon and Microsoft. Slater then actively recruited members for the group and promoted its campaigns on social media. Among the very first people to follow Engine’s new Twitter account when it launched in 2011: three Google public policy executives—Slater, Adam Kovacevich and Charlie Hale—and a policy consultant working for the company. Google has disclosed funding the group every year since 2013, though neither say how much of Engine’s budget is covered by the company, either directly or through other groups Google finances. During the past seven years, Engine has also gone to bat for Google on a number of other policy issues of importance to the company’s bottom line. At a time when Google was facing threats from rivals wielding large patent troves, Engine backed its calls for patent reform. When Congress seemed poised to pass anti-piracy bills that threatened Google’s business model, Engine helped lead the charge that ultimately killed the measures. 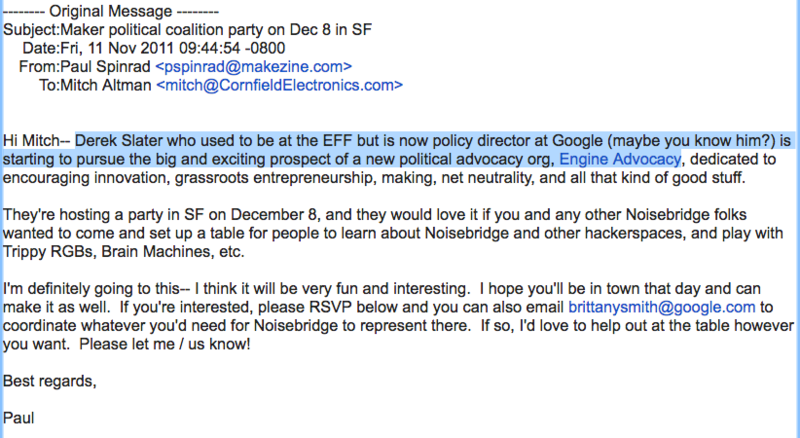 Coverage of Engine’s launch emphasized its role as a counterweight to lobbying by corporate heavyweights like Google and Microsoft. But evidence suggests it was midwifed and bankrolled by Google’s lobbyists. But Google’s creation and financing of Engine is different. Instead of joining a group that represents its interests and those of its peers, Google has used Engine to hide behind startups at a time when the company has little or nothing left in common with that group. The interests of the proverbial “guy-in-a-garage” long ago diverged from those of the tech giants, to the extent that they are now more likely at odds with each other.